Located near the town of Dubois, Wyoming, this historic guest ranch, situated at an elevation of 7,200 feet, is surrounded by unparalleled landscapes and vistas. 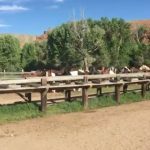 Its close proximity to Jackson Hole and Yellowstone Park make it the obvious choice for your dude ranch vacation. 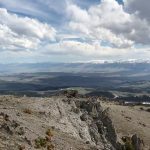 Surrounded by the Shoshone National Forest and the Wind River, Absaroka, and Owl Creek mountain ranges, this is some of the most diverse terrain imaginable. Red rock and sand-canyon draws lead you up onto high plateaus and the possibility of sighting wild horses. All meals are included during your stay and we make every effort to accommodate dietary restrictions. Our log cabins are comfortably furnished with a casual western flair, and include a small refrigerator, private bath or shower, electric heat, and outdoor sitting area. 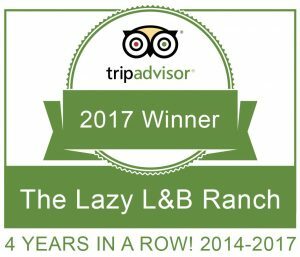 Fabulous ranch experience! I can't say enough good things about the Lazy L&B. Hey! We're the Halmays - Jason, Deb, Julia, Felicity, and Summer. 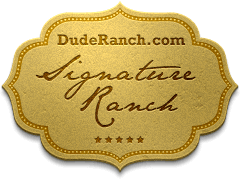 Our family would like nothing better than to welcome you to our Wyoming dude ranch to enjoy a week like no other. 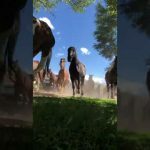 The Lazy L&B dude ranch near Jackson Hole is known for the quality, range and scope of its horseback-riding program. You'll have the opportunity to enjoy other activities such as fly-fishing, hiking, and swimming in the river or heated pool.